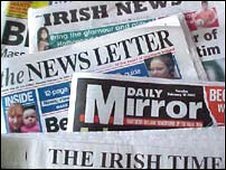 Journalist Mike Philpott takes a look at what is making the headlines in Wednesday's morning papers. The Fermanagh floods dominate quite a few of the news pages. The News Letter has a front page picture of Anthony Poulton from Lisnaskea dragging a suitcase full of his family's belongings through ankle-deep water as they abandoned their home. Four pages of pictures inside the paper show the extent of the flooding. There are stranded cars, a gymnasium under several feet of water, and people travelling along the street in Enniskillen by boat. The Daily Mirror has a shot of the Environment Minister, Michelle Gildernew, being given a guided tour of the damage - again by boat. The Irish News confines its coverage of the floods to an inside page. It leads instead with the shocking story of a woman who died a month after breaking a bone in her foot. It says Fiona Walls, from north Belfast, was killed by a blood clot. The Belfast Telegraph concentrates on the traffic chaos in Newry after shoppers headed north from the Republic. The paper says the trade war between retailers on the two sides of the border could benefit Northern Ireland by as much as £1 bn this year. The Irish Independent says public sector workers were accused of taking advantage of the nationwide strike that all but shut down the Republic, by heading north to shop. One employers' organisation tells the paper it was "beyond belief", but unions have responded by accusing the employers of trying to discredit the strike. The Irish Times comments that this is a time of national emergency, and strike action solves nothing. It says it sows the seeds of division when people need to work together. Tying the economic story in with the latest flooding, it says the 25 bn euro shortfall in the public finances is as fundamental and immediate as the rising waters of the Shannon. There is much discussion in London about the opening day of the Iraq war inquiry. It is given an added human dimension by the fact that Christina Schmid was at the same time attending the funeral of her husband Olaf, the bomb disposal expert who was killed in a different long-running military operation in Afghanistan. She is pictured on the front of the Independent, the Daily Telegraph and the Times, wearing her husband's medals. But on the subject of the Iraq inquiry, the low-key opening is the main talking point. The Guardian says that grey-suited Whitehall warriors being gently questioned by four knights and a baroness didn't exactly inspire expectations of excitement. Quentin Letts, in the Daily Mail, says an inquiry reflecting public disquiet might have seen its members dressed in gowns and operating in a semi-judicial fashion. Instead, he says, "Sir John Chilcot and his team were dressed in civvies and hunched around a table in a space not much bigger than the Big Brother diary room". The same subject features in many of the cartoons - and there is some dark humour on display. The Times has a drawing of a couple huddled on the roof of their home as the floodwater rises. The woman is saying to her husband: "Well at least we're missing the Iraq war inquiry".